ship, receive, and report shipments. Instructions for the use of ordnance transport equipment, materials to be transported, division of responsibility for carrying out inspections, and criteria for accepting or rejecting equipment are also contained in this publication. NAVSEA SW020-AG-SAF-010 contains the general information needed for you to safely perform the duties required when shipping ordnance materials. REVIEW NUMBER 3 ANSWERS A1. The two types of primary lightning protection systems acceptable to NAVSEASYSCOM are the sequentially mounted lightning system and the separately mounted overhead ground (aerial shield) wire system. A2. Lightning masts are connected to a buried primary girdle. A3. For specific requirements about the physical security of naval magazines, you should refer to OPNAVINST 5530.13. A4. Magazine inspections are conducted only during daylight hours. A5. The information recorded on the magazine inspection log above the signature of the person conducting the inspection includes the date and hour of each inspection as well as abnormal or substandard conditions of the magazines, or the word "Normal" if conditions were satisfactory. Explosives Driver An explosive driver is often an AO with an excellent safe driving record, and a person fully qualified according to Motor Vehicle's Driver's Handbook Ammunition, Explosives, and Hazardous Materials, NAVSEA OP 2239. To become a qualified explosive driver, you must meet the qualifications described below. If you meet these qualifications, you are certified to drive motor vehicles that transport hazardous materials (HM). STATE OPERATOR'S LICENSE.An explo- sives driver must hold a valid state operator's license, not necessarily issued by the state in which the activity is located. This applies to operation of vehicles both on- and off-station. This requirement is permanently waived for those personnel stationed outside the 50 states that would otherwise be eligible to obtain an explosive driver's permit. 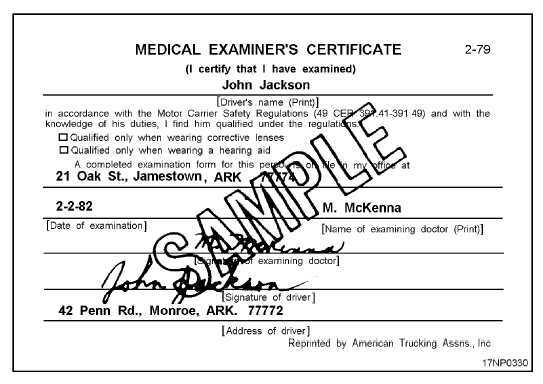 MEDICAL EXAMINERS CERTIFICATE. An explosives driver must undergo a explosive physical examination and, on the basis of such an examination, be certified by a licensed doctor of medicine or osteopathy to ensure that he/she meets applicable 12-20 Figure 12-4.Medical Examiner's Certificate, ATA Form C0750.